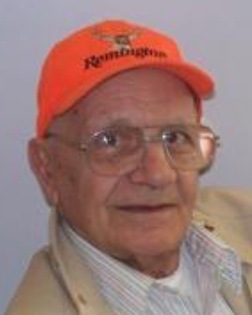 Francis H. Agliardo, 94, of Guy & Mary Felt Manor, Emporium, PA died at Penn Highlands Elk, St. Marys, PA on Saturday (July 7, 2018) morning. He was born October 18, 1923 in St. Marys, PA a son of the late Angelo and Captolia Chandler Agliardo. He married the late Jean Gormont Agliardo. Mr. Agliardo joined the US Army's 8th Air Force after high school and served in WW II and the Korean War. He was a supervisor at Sylvania from which he retired after many years of employment. He enjoyed farming, fishing and going to camp and most recently walks with Forrester. He was a member of the Bucktail Rod and Gun Club, VFW, Legion and the Knights of Columbus. He loved his grandchildren especially, fishing with them. He is survived by son, Edward (Cheryl) Agliardo, Port St. Lucie, FL; daughter, Linda Andrews, Emporium; son, Francis Agliardo, Jr., Ft. Myers, FL; son, Michael (Robin) Agliardo, Emporium; daughter, Cindy (David) Smith, Coppers Cove, TX; daughter, Bonnie Agliardo, Kill Devil Hills, NC; daughter, Susan (Paul) Tresatti, Allison Park, PA; daughter, Karen (Mike) Spencer, Inman, SC; daughter, Lori (Tony) Heinrichs, Verona, WI; sixteen grandchildren, fifteen great grandchildren, three sisters, Mary Hasselman, St. Marys, Alice Anderson, Richmond, VA and Patty Heitner, Ft. Lauderdale, FL; one brother, Angelo (Mary) Agliardo, Niantic, CT. In addition to his parents and wife he was preceded in death by two brothers, Burton and Edward Agliardo and sister, Betty Jones.